Every year, the online gambling platform amasses a bigger following than it did before, which calls for the provision of more services. This rise in demand has resulted in the cropping up of numerous online game software developers, among them being Magnet Gaming. This game developer is not the most popular one among online punters, and it has only been running for five years since 2014. The game developer runs operations from Denmark with a small team of about one hundred employees, and it is the subsidiary of the gaming firm CEGO ApS. Even though Magnet Gaming has only been around for five years, the work it has done so far shows promise for the company in an industry well-known for its aggressive competition; this has been aided by the fact that CEGO has been around since 2000, which gives it ample experience on service delivery in the gambling industry. Despite the small-scale nature of Magnet Gaming on a global scale, the company is doing wonders for the Danish gambling market. According to statistics, this software company has one of the highest client retention rates, which means that players who have engaged in their sets have a high rate of coming back for more gameplay. These rates are said even to be higher than those of most big game developing firms. Among the main reasons that have driven this company to high levels of success is the entity’s fundamental elements in game development which revolve around reinvention and entertainment aside from just providing real money payouts. That way, players can have fun despite the results of each spin. The company only includes slot games in its catalogue, and there are only twelve titles included. This number is small considering there are others with thousands under their belt. However, the limited portfolio is understandable considering the short time the company has been running. Unlike most modern online gambling software providers that lean towards the use of five reels in slots only, Magnet Gaming tries to maintain a balance with the classics as well. Therefore, some of the twelve titles use three by three or three by four grids. However, even though the three reeled sets are inspired by the setting of their traditional counterparts, the game provider uses state-of-the-art graphics and animations to add a sophisticated touch. Even with just twelve Magnet Gaming online slots, this developer manages to explore themes in a diverse manner, which allows it to accommodate punters with different needs. 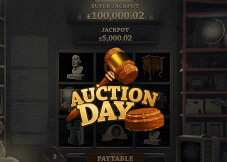 Some of the themes explored include history and war such as in Vikings: Wheels of Valhalla, greenery and farmlands in Sunny Farm Slot, and history in the Auction Day Slot. This developer uses the three-dimensional imagery in nearly all its releases, which has become a popular element with slots in recent times. 3D graphics and animations place the characters of each game somewhere between the cartoon and real world, which makes for a unique experience. As earlier mentioned, the developer uses a different theme in each of its sets, which provides a unique experience. The slot games carry a varying number of win lines which affects the stakes placed along with the chances of landing winning combinations. Wagers are flexible for a wide range of players. Magnet Gaming slots online for free and real money are built using HTML5 technology; this makes them compatible with numerous mobile operating systems and can be played in a no download mode on the devices they run.